So, this past summer, when 17 family members decided to get together, I was happy when the plan evolved into renting a house near Rosemary Beach. It would be a staycation for us and we had lived in Seacrest before moving to the west end of 30A. I was excited at the thought of showing them all the fun to be had on the east end of 30A, especially with the ongoing growth in each community. Alys, Seacrest, Rosemary and Inlet Beach have much to offer 17 family members with a range of interests. I knew we could walk or bike anywhere between these communities, so my dreaming began. Maybe they would enjoy riding their bikes down the palm tree-lined streets of Alys Beach in the morning to get donuts, or at night to grab a drink at the new bar. Letting the kids play in the fountain or roll around in the grass would be fun, before we all head to the beach with our picnic lunch. Or maybe they would enjoy watching a movie or listening to a live concert at the Alys Beach Amphitheater. Perhaps, after swimming in the 12,000 square foot lagoon pool in Seacrest Beach, we could all pick up pizza and eat it at the pavilion while listening to music, then browse the shops. The idea of enjoying ice cream after a hot day at the beach might also be appealing, I thought. My dreaming continued...A morning venture with all 8 kiddos, skipping along the sidewalks of Rosemary Beach to the playground, might wear them down before their afternoon nap. Maybe a Sunday morning bike ride to the Farmers Market would be enjoyable. Or watching the spectacular actors in the summer outdoor theater series would be awesome fun for everyone. Perhaps, we could get a babysitter and explore the new stores at the 30Avenue boutique retail center in Inlet Beach, tasting wine along the way. Eating at one of several new restaurants, while sitting outside enjoying the summer breeze, would be glorious. Finishing the night by taking a jaunt down to the beach to watch the breathtaking sunset would certainly be a wonderful way to end the evening. And then...life happened. Everyone arrived and said the normal hellos we all do when we haven't seen relatives for a while. My sister mentioned that Ella, her 15 month-old, had thrown up while traveling. Now, if you have children and hear this, you know you just go with the flow, literally, in this case. Ella is so tiny, no more than 18 pounds. But, we learned as the week went on, never underestimate the power of the small, but MIGHTY, Ella. Our sweet Ella helped create a vacation to remember for years to come. One by one, 13 out of 17 of us enjoyed the comfy beds of our beautiful rental house for at least a day. Instead of exploring the great outdoors of 30A East, our fun centered around making bets on who would be the next man down, or the last man standing. Ginger ale became the drink of choice. Looking at food scared us all. But lucky for us, as locals, we had already enjoyed eating at most of the restaurants along 30A East before our family adventure began. Each restaurant embodies a unique and inviting atmosphere with some tasty signature menu items. And the food is phenomenal. The servers, top notch. In addition to a multitude of restaurants, each community offers countless opportunities for shopping and plans seasonal activities for both adults and children. 30A East is an easy 20 to 30 minute car ride, depending on traffic, from Northwest Florida Beaches International Airport. After arriving and securing your bike rental, your options for exploring each of the neighboring communities of Alys, Seacrest, Rosemary and Inlet Beach are endless. 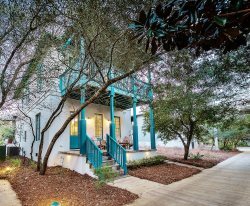 Each community personifies a distinctive look, fostering a sense of wonder and encouraging visitors to tour the area while creating your 30A East family vacation memories.